Sloth is not a nickname most people would be happy about. Slow moving and unenergetic are its main traits. It spends it life just “hanging out”. The algae growing on its fur gives it a green color that acts like camouflage. So what might seem like a giant clump of leaves hanging from a branch in the rainforest canopy may really turn out to be a sloth. The sloth grows to 20-29 inches in length and can range from 9 –19 pounds. His most outstanding feature is his feet. Sloth toes are tipped with giant, curved claws that look like meat hooks. 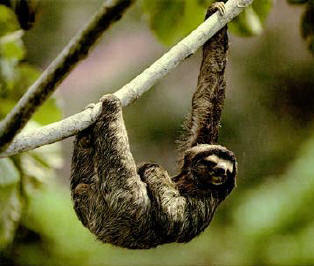 The sloth might use them to defend himself, but they work best for hanging out in the rainforest treetops. The sloth’s fur grows backward from most animals to let water run off him while he’s hanging out. The outside coat of fur has large grooves in it that collects and grows algae, which gives him the greenish look. It makes great camouflage for a sleepy sloth to take a safe nap. Yummy, luscious fruit and not so yummy dry leaves and twigs make up the diet of a sloth. Everything they eat can be found in the trees they live in. Their favorite feeding time is in the hour before sunset. Sloths do everything upside down, including mating. Females tend to “hang out” together, while the males are the solo type whom only “hang out” long enough to mate. He then heads out on his own again. After 263 days, the mother sloth gives birth to a baby who immediately hooks its claws into its mother’s breast hair and stays there until it is weaned and able to get its own food. Can you guess how a sloth walks on the ground? His claws won’t allow him to walk upright. He has to crawl on his belly and use those meat hook claws to pull himself along. Is it any wonder he chooses to hang out in the trees? A sloth climbs down from its tree about once a week to urinate and defecate. E-mail to add your Sloth related website.